Over the past decade there has been a great need for better technology solutions to address global demand driven and enterprise-wide supply chains. While lean manufacturing initiatives have instigated certain processes, such as Kanban, the reality for global manufacturers is simple: ERP (enterprise resource planning) solutions (from NetSuite to Oracle to SAP and others) have failed to deliver the promises needed. ERP is a critical and important aspect of any manufacturing firm; it is not a panacea. Over the next few months we are going to explore some of the reasons why ERP-based supplier portal solutions struggle to provide the tools required by manufacturers to visualize, collaborate, execute and manage extended enterprise value chains. The goal of this conversation is to address the realities, limitations, and efficacy of technology solutions that work cohesively for global manufacturing firms operating in today's intensively competitive and constantly changing global marketplace. ERP and MRP systems were never designed with the end-goal of helping manufacturers synchronize production and supply chain operations; they were designed around MRP Forecast Management. Daily, the people at Upland Ultriva listen to manufacturers describe the challenges they face trying to plan and execute day-to-day production and supply chain operations based on inaccurate sales forecasts. This problem is echoed by their supply chain partners who experience frequent changes in the gross requirement forecasts; these predictions represent the total of independent and dependent demand for a component before the netting of on-hand inventory and scheduled receipts. Forecasts received for planned or firm orders are expedited, deferred, or cancelled. The impact of constantly changing forecasts creates scheduling problems for production planners which reverberate through production lines to suppliers who suffer from a bullwhip effect. To help address these issues, ERP vendors are fielding evermore complex S&OP (Sales and Operation Planning) and APS (Advanced Planning System) modules that require vast amounts of data from multiple organizations. Expert users are tasked with interpolating the data and then making decisions based on assumptions. It is not difficult to predict the outcome of such a complex process, especially when the primary input is a nominally accurate sales forecast. Analyzing the health and activity of participants and processes across an extended enterprise value chain is a mandatory requirement for any competitive global manufacturer. It requires the ability to monitor all participants that touch a transaction anywhere along that supply chain including OEM customers, distribution centers, manufacturing plants, and raw material suppliers. To achieve this level of integration and information across an extended enterprise value stream requires organizations adopt a new way thinking. Demand driven enterprise-wide supply chain solutions can define the structure of enterprise value streams by assigning attributes to each participant. Attributes include, but not limited to, a "Consuming Entity," a "Supplying Entity," or a "Consuming & Supplying Entity." Once assigned, the relationships between entities are established and material replenishment loops are created. 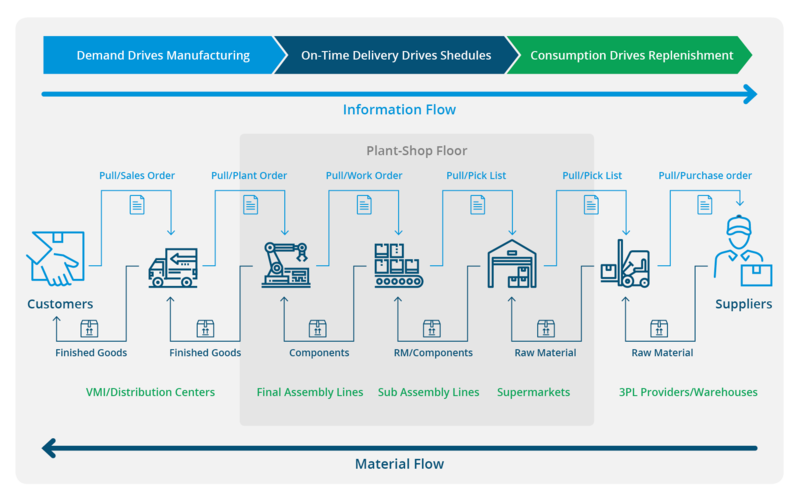 Demand signals, such as pull signals, sales orders, work orders, are released upstream (information flow) by the Consuming Entity as materials are consumed. These signals place demand on the Supplying Entity as the signals propagate through the value stream. A vast amount of activity occurs beyond the four walls of manufacturing plants. Global manufacturers must take full advantage of private cloud-based supplier portal solutions which extend ERP applications beyond the four walls to all participants in an enterprise value stream. Providing tools which define the structure of enterprise value streams is critical. By establishing the roles and relationships of each participant, and monitoring real-time activities, global manufacturers are best able to synchronize supply chain and production operations. Manufacturers cannot afford any mystery about the broader supply chain. This enhanced level of visibility, collaboration, execution, and control, provides a constant stream of actionable business intelligence based on accurate customer demand.